Performance Portfolio - publication of old road tests. Majority of these articles are not group tests unlike the 'Takes on the Competition' book. I keep picking this book up even a year or so after buying, if the photos were of better quality it would be the biz. It is the prefect buy for someone who hasn't bought their first 928 and is unsure about the model history. 928 Takes on the competition - you can get this from amazon uk or 928 International now has these in too. These are group tests and most of them are against the XJS and SL but no surprises there. If you have the previous book this is a good addition. Project 928 - was only in print for a couple of years from 1977 so you have to do some searching, details the development of the car and has plenty of photographs & illustrations. Also came bound in leather if you want to spend $$$$$$. I would have loved more technical detail but it was written for the 'masses', I particuarly like the small paragraph on how an investigation was done on using half of the V8 for a 4 banger but nothing ever came of it. Guess the dust must have been real thick on that investigation when the 944 came around. Once you have read the others this one doesn't add much, I was 928 info hungry at the time of purchase (I was still looking for a the right 928). 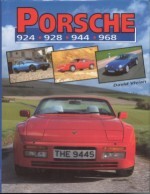 What I like about this book is the articles on the Porsche racing cars, great stuff. This book has some glossy pics and some information you could pick up on the net, has two pages of an early Euro 928. Excellence - American publication that comes out about 8 times a year, known for its '928 update' that could do with a little more research on the price front. 911 & PorscheWorld - I like this not because of the British connection but because it is a bit more down to earth and not as 'glossy' as some others. Owners reports is one of the more popular columns. Chiltern Repair Manual - Only covers early 928's and is out of print, heard differing opinions on this, some say it is excellent others that it is good for nothing (or words to that effect). Often see these on Ebay. 9 Volume Factory Manuals - Badly presented and indexed but hard to do without, available on Microfiche (cheap) and print (expensive). Tech Spec Book, invaluable for the those DIY mechanics as it has some valuable information that is much easier to find than in the Factory Manuals. Of course it isn't a substitue. These can generally be found on Ebay for a few bucks, I have the sales (Dealer & Customer) brochure for 1991 and the press release package for that year also. 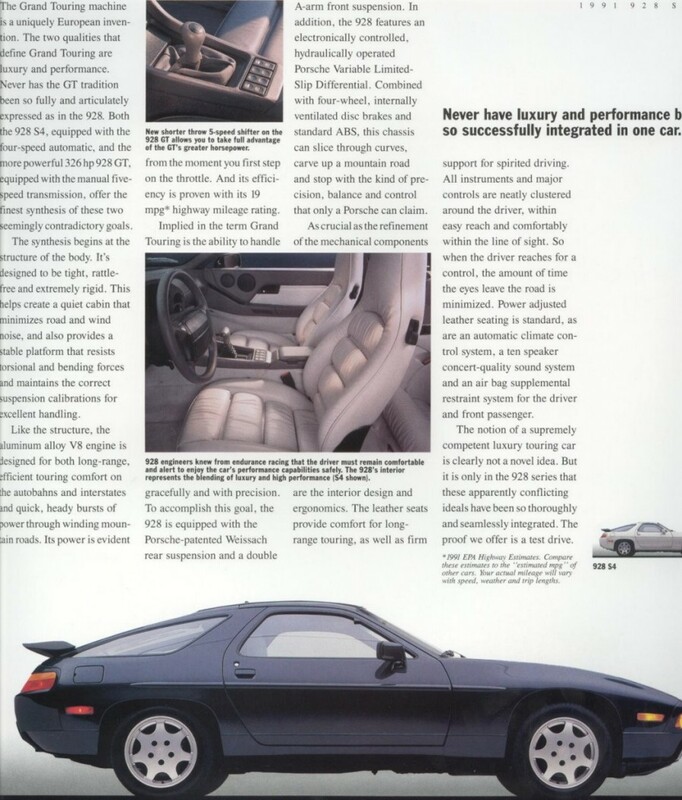 Below is a pic from the 1991 dealer brochure. It would be nice to have the color brochure and the price list but havn't come across them yet.